It’s Monday, and therefore the start of two very intense weeks of el Sistema-related activity in Europe. In what will be the biggest event in Stirling in 715 years, the Símon Bolívar Orchestra will play an outdoor concert Thursday, June 21st, to kick off the London 2012 Festival. The visit of the orchestra to this corner of the British Isles is a wonderful testament to the close relationship between the Fundación and Sistema Scotland, and fantastic vote of confidence in the achievements of the latter. Back in early February in Los Angeles I had the very good fortune to share a table at lunch with Nicola Killean, Executive Director of Sistema Scotland, and heard firsthand the details of the collaboration between the organizations. It will be a tremendously rich experience for all involved, but particularly the musicians of Big Noise, and I wish I could be there for the entire visit – I’ll actually be in Europe, but I’m committed to working with the equally excellent but far less visually colourful Tonhalle Orchester in Zürich that week. 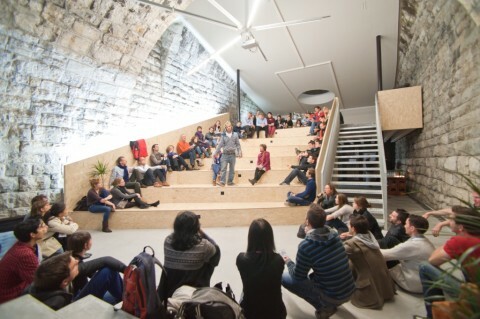 Come the weekend, it’s Sistema time for me: at the very gracious invitation of Etienne Abelin of Superar CH, the Swiss offshoot of Austria’s program, I will be speaking at a special evening devoted to social action through music at Hub Zurich. The event starts at around 6:30pm with a barbecue, and my remarks at 8pm will preface a showing of the Smaczny/Stodtmeier film el Sistema. As with any event in which barbecue features prominently, this will be very informal and relaxed. If you can join us please do. Special thanks to the Canada Council, the Tonhalle Orchester, Superar CH and Swissôtel Zürich, all of whom are contributing to my presence there. For those in Britain for the Stirling show, on Monday June 25th Southbank Centre in London is hosting the Festival of the World Summit, entitled “Art will change the world.” The event will be a broad look at the arts – from a multi-disciplinary perspective, not just music – as a catalyst for positive social change. I’ll be making a 20 hour visit to London as the guest of SBC to be part of a special, extremely pragmatically-oriented session on essentials of social action through music. Hosted by Marshall Marcus, the talk will include a detailed discussion of the Logic Model. 2pm at Queen Elizabeth Hall, but the entire day’s program looks excellent, and very well thought through.